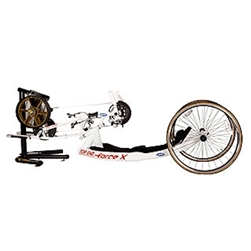 Excelerator™ Stock Handcycle can go up to 15 mph. Adjustable fore and aft seat position makes transfers easier. Adjustable dual footrests and safety straps. Large mountain tires for hills, rocks and rough terrain. The Bike with Bite. Meet the Quickie Shark. It can be individually suited to the rider's specific seat-angle position. The newest addition to the Top End Force Family, great for both beginners and veteran handcycliers. Wrap-around frame design - Cable-driven parking brake. 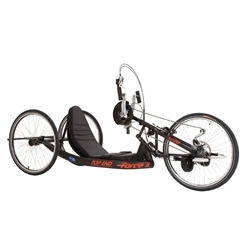 Features an adjustable, trunk-powered, erect position for low paras, amputees, and competitors. Force G’s center frame design also allows for transfers that are easier than any other handycles in its class. The Force RX gives you two back options: carbon fiber or welded. Looking for speed and adjustability? Well now you can have both with the new Top End Force RX. After his first test ride, Team Invacare®'s Matt Updike said: "This trainer is super smooth and feels as real as the road!" Safety, comfort and performance are distinguishing characteristics of all of our handcyles. If recreation is your goal, the Invacare® Top End® Excelerator Series Handcycles and Invacare® Top End® XLT Handcycles are great models as they feature low maintenance 7 speed hubs with reverse hands-on braking. We have the Invacare® Top End® Li’l Excelerator Handcycle for kids too! For long distances, touring, or hilly terrain, your best ride is the Invacare® Top End® Force-3 Handcycle because it features 27 speeds and hands-on shifting and braking. 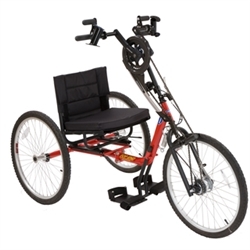 Information about this model can be found on the Competitive Handcycles link. All of Top End recreation handcycles are equipped with a safety flag, full composite chainguard, cushion and seat/chest restraint as standard, for extra value, comfort and safety. Have a question or concern, looking to get your new Handcycle, our Handcycle Expert is a seasoned pro and a daily rider. Call us a 866-218-0902!